With the Traditional Courts Bill before Parliament, Contralesa sounding off about gays, and a certain artwork sitting before the High Court, it’s a good time to consider the balance between protecting cultural norms and constitutional rights. A discussion on Thursday about cultural and religious fundamentalism gave an interesting pan-African perspective on the matter. One reassuring message to come out of this week’s Open Forum conference was that South Africa is not the only country grappling with what often seems like a substantial divide between that which is claimed as African culture and the constitution of a liberal democracy. Thursday’s discussion was focused on “fundamentalisms” and the concept was defined quite broadly, allowing for the consideration of matters ranging from The Spear to Sharia law. It was clear this was a discussion whose time had come. Malian rights activist Jessica Horn explained that by “fundamentalism” she meant a way of thinking that was “absolutist and intolerant, a singular way of being and belonging”. She then asked audience members, drawn from all over Africa, to raise their hands if they felt like fundamentalism of some sort was increasingly having a negative impact on their work. Almost every hand in the room went up. Binaifer Nowrojee, executive director of the Open Society Initiative for Eastern Africa, addressed the matter from a Kenyan perspective. She made the point that fundamentalism, whether religious or cultural, is rarely about what it purports to be. Issues like gay rights or women’s reproductive rights, she suggested, are often seized upon as a pretext to disguise the ultimate aim, which is to undermine democratic structures. Nowrojee cited the role played by some of Kenya’s evangelical churches during the process of consultation about the Kenyan constitution as an example of this. The churches launched a vociferous campaign against homosexual marriage, despite the fact that gay rights advocates had not yet put gay marriage on the agenda. It was clear, said Nowrojee, that misuse of the sexuality debate allowed them to hide wider non-democratic agendas by couching their objections in the language of religion. Zimbabwean author Petina Gappah said a similar process could be witnessed in Zimbabwe in consultation around that country’s constitution: “Those who don’t want reform are hanging their hat on the gay issue”. In illustrating the tension that can arise between rights of individuals and religious beliefs, Gappah, who is also a lawyer, made reference to a Nigerian case where a famous “witch exorcist”, Helen Ukpabio, had made her name by specialising in the exorcism of children. If a two-month old cried excessively, Ukpabio held, it was evidence that he or she was in the service of Satan. In response to complaints from child charities, the Nigerian state made it a criminal offence to accuse a child of witchcraft. But Ukpabio, with astonishing chutzpah, responded by suing the state for interfering with her right to believe in witchcraft. When it comes to considering the balance between rights and religion in cases like these, Gappah believes an appeal to normative principles is key. “We must ask: What is the foundation of the country we want to build, and what international statutes have we signed up to?” she said. A cool-headed look at the legal principles agreed on is what is important in cases like these, says Gappah. She dismisses the argument that these rely on capitulation to “foreign norms”, saying they are not foreign unless agreed on. She scoffs at the notion that democracy was a borrowed concept. This was a point also made by former Mozambican President Joaquim Chissano at a discussion at the conference on Tuesday. Participation in civic life is something that has always been part of African tradition, he said, even if it once took place under a tree rather than in a parliamentary building. Addressing this notion of imported, “un-African” norms, Horn said she found it odd that people were sometimes so vocal about rejecting gay rights and women’s rights on the grounds that they are “not African”. “Why are you proud of articulating an Africanness which is so violently intolerant?” she demanded. It was South African author Mark Gevisser who brought the discussion round to The Spear, which he said “cuts to the heart of the entire conference”. 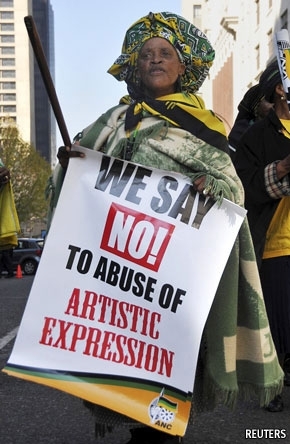 Explaining the saga to the audience – some of whom had not yet heard of the matter and seemed shocked by the ANC’s response – he said that what interested him was the manner in which “fundamentalist notions of art” can be used to clamp down on freedom of expression. Gevisser went on to describe the Traditional Courts Bill, which he said defined the “challenge of squaring a human rights regime with traditional forms of justice”, and the issue of the Constitutional Review Committee being chaired by Contralesa head Patekile Holomisa, who recently recommended that gay protection should be removed from the Bill of Rights because the majority of South Africans don’t support it. All three cases, he said, illustrated the ways in which tradition and culture can be used to undermine human rights. However, he said, when the ANC is in a corner, it has no choice but to defend constitutionalism. When Holomisa made his claims about homosexuality, a statement was put out by ANC chief whip Mathole Motshekga, reminding the country that this was not ANC policy. Similarly, Jacob Zuma was obliged to distance himself from the allegation that he had said his youth, if a gay man was in front of him he would have struck him. “He was forced by the culture of constitutionalism at the root of this country to retract,” said Gevisser. It’s an intriguing idea. If there’s something to it, we’re likely to see many more continent-wide battles between constitutions and cultures.